Freshly minted Gov. 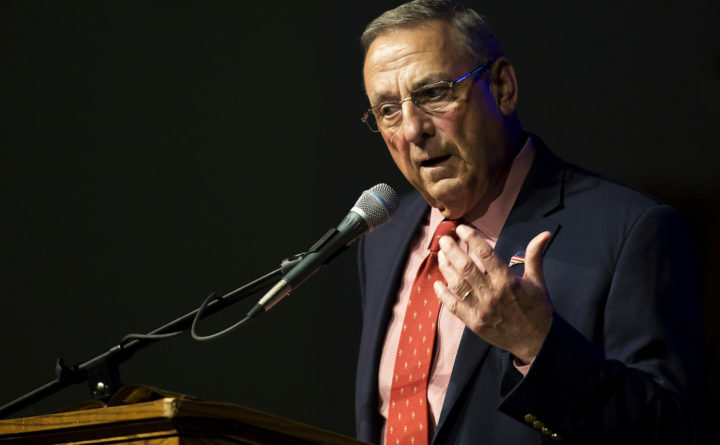 Paul LePage gave his renamed Governor’s Energy Office a clear goal in 2011: lower power costs. A new Republican majority helped embed the mantra in other areas of state law, too. LePage signed bills adding it to job descriptions for Maine’s utilities regulators and the state’s advocate for utility customers. In his first State of the State address, he decried high power costs as a major drag on Maine’s economy. Six years later, the state still ranks fifth for per capita energy expenditures. Maine’s power prices have held steadier than most states, but prices have climbed and are still — alongside the rest of New England — among the nation’s highest. In that time, the wind turbines LePage decried in 2012 as a ” boutique energy source” have proliferated, natural gas lines he championed hit major hurdles and the region still lacks transmission lines required to bring more hydropower from Quebec into Maine. The former business executive has grown increasingly frustrated with the situation, butting up against challenges Maine policymakers cannot control alone and regional efforts that hinge largely on the will of Massachusetts. The difficulties prompted the sharp-tongued governor to criticize lawmakers and, this year, his own appointees to the Maine Public Utilities Commission, saying he wished he could fire them all over a temporary solar energy policy they crafted. His former chief counsel, Carlisle McLean, resigned from the commission in June. It’s been shorthanded in the two months since, awaiting a LePage appointment. His energy office had no director for nine months between the resignation of Patrick Woodcock in late 2016 and the appointment of Steven McGrath late last month. When LePage signed the bills calling on his energy office and state agencies to focus on reducing power prices, the state ranked eighth in the country for residential power prices. This past April, Maine ranked ninth, with prices up 4.7 percent from six years earlier. While that’s no progress on improving Maine’s relative ranking, Maine’s prices grew at one of the slowest rates in the country. Those prices include the costs of electricity, which has been dropping, and the cost of delivering that electricity, which has been rising in Maine and New England. For most residential customers in Maine, the cost of delivering electricity outstrips the cost of electricity itself. Massive system upgrades have contributed to that and could pile more on in coming years. The trouble is, some of those costs aren’t going away, unless Mainers decide to make some adjustments to the way life should be, according to former Public Utilities Commission chairman Tom Welch. Welch, who led the commission through four governors including LePage, said in a February interview that culture and the nature of Maine’s rurality drives some of those costs. Major manufacturers have cited energy and fuel costs as contributors to their downfall, but each case is unique. For instance, energy costs were not the only thing working against the paper industry. Whatever the causes, the decimation of that industry doesn’t help the rest of electricity customers. Utilities have fixed costs to maintain the grid, and the loss of big users means there are fewer major customers to underwrite grid maintenance. That’s apparent in Emera Maine’s Bangor Hydro Electric service district. “At one time, the electrical system in our service territory was built to handle the capacity from paper, textile, and many other manufacturing industries that have long since left our area,” wrote Allison Doughty, a spokeswoman for Emera Maine. As LePage issued is cost-cutting edicts in 2011, large customers in Emera Maine’s Bangor Hydro Electric district consumed 19.5 percent of the system’s electricity. Last year, their use dropped to 14.5 percent, according to regulatory records. The silver lining, Doughty wrote, is that there’s already room for new businesses and for existing businesses to grow in ways that won’t require costly system upgrades. Customer bills also include charges for power plants and infrastructure no longer in use, called stranded costs. Some were an artifact of the era before 2000, when utilities also generated electricity. A big batch of those costs expired for Central Maine Power Co. customers in July. While those significant stranded cost arrangements were long set to expire, Angela Monroe, acting director of the Governor’s Energy Office, said regulators during LePage’s tenure have avoided adding to that bill by opposing long-term power purchases at above-market costs. Deals like a $13.4 million bailout to prop up biomass generators — and preserve a market for loggers hit hard by paper mill closures — would have added to those stranded costs, but lawmakers decided instead to pay for that using surplus tax funds. Large manufacturers such as Bath Iron Works and Catalyst Paper in Rumford had opposed adding that tab to energy bills, and LePage agreed. Two months after railing against ” picking winners and losers” in state energy policy, LePage signed the bill using taxpayer dollars to subsidize production by four biomass plants. One company operating two of those plants is apparently in financial distress, even after LePage went to bat for it to change conditions of its subsidy arrangement. Loggers and other vendors have said Stored Solar hasn’t paid them in months. It’s not just the current Legislature that’s erected roadblocks to LePage’s agenda. Many aspects of energy policy are far beyond the reach of just one governor, no matter how “business friendly.” Part of that is intentional. Welch, the former PUC chairman, said in a February interview that insulation from politics gives commissioners room to rule independently. “The irony is that it’s a very business-friendly approach to have that kind of stability,” Welch said. And there’s another level of distance. While the governor appoints commissioners, they follow laws passed by the Legislature. Regional, national and practical challenges also limit the impact one governor can have, even when the rest of the government is with him. Most of Maine is part of the broader New England energy system, managed by the nonprofit ISO-New England, which manages the region’s competitive market for electricity generation. In that market, Maine is a relatively small fish, accounting for about 9 percent of the region’s power consumption. That limited the influence of Maine committing electricity customer money to new natural gas projects before any other states. Regulators’ decision, after years of deliberation, reflected that reality, too. They determined it’s only worth it after other states follow suit. Other states — notably Massachusetts — did not. “One of the governor’s primary frustrations has been the other Northeast states’ roadblocks to moving these pipelines forward,” Monroe wrote. LePage championed those natural gas projects as a way to reduce electricity costs, by eliminating a bottleneck for the natural gas-fired power plants that provide almost half of New England’s electricity. It’s not the only time outside forces have trumped LePage’s wishes. For example, wind power tax credits and renewable standards in other states boosted wind generation dramatically during his time in office. In some cases, expedited permitting passed during Gov. John Baldacci’s term made that easier. In April 2011, wind accounted for about 5 percent of all the power generated in Maine. This year, it’s made up around one-fourth of all the power generated in Maine. In June, only hydroelectric dams generated more power. But some of the same outside forces propelling wind growth could end up being essential to LePage’s long-held desire to bring more hydropower from Quebec onto the New England grid. Massachusetts received numerous such proposals to meet their renewable power goals. Despite LePage’s staunch opposition, regulatory rules, market forces and renewable standards in other states have helped solar power grow, too, though incentives under state regulatory rules will begin to dwindle in 2018. Maine’s solar generation more than doubled from 2014 to 2016, though the state had about half the capacity of neighboring New Hampshire and about a third of Vermont. Just a year into LePage’s term, a return to divided government made it harder for the governor to pass his energy agenda, resulting in stalemates on big issues. The divide over solar energy policy this past session provided a prime example. Facing much narrower policy choices than an earlier solar policy battle, lawmakers entered a bitter late-session fight fueled by intense lobbying and pressure on House Republicans from the governor’s office. Enough Republicans switched their votes to sustain LePage’s veto, delivering a small victory. For all the hand-wringing, it left in place a policy from the Maine Public Utilities Commission that LePage also did not like. In February, he wished aloud that he could fire all three commissioners, including his former attorney, over their ruling. The Omnibus Energy Act of 2013 was a cornerstone of LePage-era energy policy, setting out how the state could promote construction of more natural gas pipelines and redirecting resources of the state agency that finances energy efficiency investments. Republican House Minority Leader Ken Fredette and Democrats John Cleveland, then a senator from Auburn, and former Rep. Barry Hobbins (now Maine’s public advocate), of Saco, praised the bill in a letter to the Bangor Daily News, touting its ability to reduce power costs through a section called the Maine Energy Cost Reduction Act. Years later, the promise to backstop new natural gas pipelines fell victim to a prohibitive court ruling in Massachusetts. In June, Enbridge withdrew plans for a pipeline Maine regulators picked as the most likely to reduce regional energy costs. The legacy of that Energy Cost Reduction Act became nearly two years of deliberation for regulators and work for consultants hired to model hypothetical changes in regional energy infrastructure. The effort built on LePage’s earlier promotion of natural gas. A 2011 bill allowed natural gas utilities to qualify for financing through the Finance Authority of Maine and in 2012 a potential state contract enticed two natural gas companies to expand in the Kennebec Valley. Natural gas utilities grew their customer base 42 percent, to 45,599 customers, from 2012 to 2016. The growth slowed after 2014, when oil prices fell through the floor. The legacy of the broader omnibus bill lives on in other ways. Efficiency Maine’s budget has remained relatively flat under the bill, shifting focus more to commercial and industrial programs and heating system conversions. That’s an area where LePage does tout progress, helping to make the nation’s most heating oil-dependent state less so. A 2011 law directed the state to make such a plan. Efficiency Maine has provided rebates for at least 26,000 electric heat pumps, according to Monroe. She said that’s saved heating costs and displaced carbon emissions equal to roughly 15 times the reduction from all of the installed rooftop solar panels in the state. “The governor’s energy goals have been to reduce energy costs, do no harm to the environment, and reduce the State’s dependence on home heating oil,” Monroe wrote. Notably, the bill also involved a late negotiation by LePage that derailed Norwegian company Statoil’s plans for an offshore wind project in Maine, but it created an opening for a floating offshore wind project led by the University of Maine and Cianbro. As a result, the project inked a preliminary power purchase deal with state regulators. That deal would have Maine electricity customers pay above-market rates to get new technology off the ground. The agreement helped the project leapfrog other applicants for a U.S. Department of Energy award of up to $40 million. The department is still drafting an environmental assessment for a full-scale test site of UMaine’s project off Monhegan Island. The LePage administration is apparently conflicted about having demanded UMaine’s project get a shot at a term sheet. In May, the acting director of his energy office, Monroe, told lawmakers that LePage’s office has concerns that the deal is too costly. “…market prices were spiking at the time the term sheet was submitted,” Monroe wrote. Monroe wrote it’s a concern shared with PUC Chairman Mark Vannoy, who voted against the deal. The two commissioners who voted for it are gone and Vannoy early in his chairmanship helped set a precedent for reopening negotiation of such term sheets based on changes in energy prices. The scenario sets up a hallmark of energy policy in LePage’s second term: a controversy that gives the governor a pulpit for his top energy priorities, even when he doesn’t have a seat at the table.